During the Soviet regime, the history of the first independence of Armenia was thoroughly distorted and the commemoration of May 28 was logically forbidden. The explosion of the Karabagh Movement in 1988 would change the general outlook. The claims to reunite the autonomous region of Mountainous Gharabagh to Armenia were accompanied by claims to address social, economic, and cultural burning issues of the present and hidden or distorted issues of the past. From February 1988, huge crowds gathered at Theater Square (now Freedom Square), in front of the Yerevan Opera, in peaceful rallies to claim for the return of Gharabagh to Armenia. One such rally was held in the afternoon of May 28, 1988, to commemorate the seventieth anniversary of the first independence. The well-attended gathering was organized by the Union for National Self-Determination, a political party founded by dissident Paruyr Hayrikian in 1987. Hairikian had been imprisoned in early 1988 for claiming that the Sumgait pogrom had been instigated by the Soviet leadership, and he would be stripped of Soviet citizenship and deported to Ethiopia. Other members of the party had taken charge, especially Movses Gorgisian (1961-1990), assisted by Mekhak Gabrielian. The “Mashtots” Union, an organization for the defense of Armenian language and culture, was also involved in the preparation. Banners placed on the stage read: “To proclaim May 28 day of united, all-national struggle for the just solution of the Armenian Cause” (Մայիս 28-ը հռչակել Հայ Դատի արդար լուծման համազգային պայքարի միասնութեան օր), “The only road to salvation of the Armenian people was found on May 28, 1918” (1918 թ. Մայիսի 28-ին գտնուեց հայ ժողովրդի փրկութեան միակ ուղին), “Today’s Armenia would not be a republic without May 28” (Առանց Մայիսի 28-ի այսօրուայ Հայաստանը հանրապետութիւն չէր լինի). “The enemy reached Yerevan. The supreme command of the Armenian forces, led by Nazarbekov, had decided to hand Yerevan to the enemy and to organize the defense near Lake Sevan. The National Council of Tiflis had agreed with this decision. There was one man in Yerevan who said ‘No, if we hand Yerevan, then we will hand Armenia. If we hand Yerevan that means the end of the Armenian people.’ That man was Aram Manoukian. Unfortunately, I don’t see his picture here.” People held pictures of General Antranik, Karekin Nejdeh, various fedayis and also Hayrikian, who was then in a Moscow prison. After the speeches, the doors of the Opera opened and the secretary of ideological issues of the Central Committee of the Armenian Communist Party, the first secretary of the City Committee of the party, and other officials came out. They tried to take out the tricolor flags from the square, but in vain. They were met with cries of “Shame, go away!” Later on, poet Sylva Gabudikian had a televised speech, where she argued that the tricolor flag fragmented the nation, as it divided Armenia from the Diaspora. 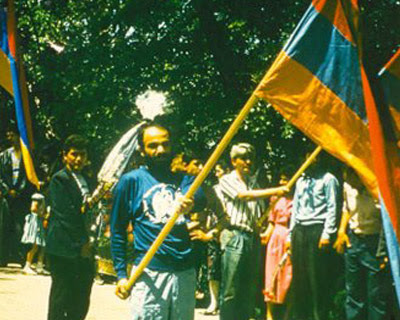 From then on, the flag of the first Republic of Armenia would start appearing in the demonstrations for Gharabagh, and the idea of independence would begin taking roots. Two years later, on August 23, 1990, the Republic of Armenia would be reborn instead of the Armenian Socialist Soviet Republic, and the referendum for the independence would be held on September 21, 1991, while the once powerful Soviet Union was collapsing.